Give walls a magical transformation with Fantastic Beast and Where To Find Them wall decals by RoomMates. Complete with 12 wall decals featuring real scenes from the movie, this wall decal set is a must have for fans of all ages. Instantly bring a wizarding world to your wall decor with two simple steps – just peel and stick. Like magic, your walls will begin to evolve in minutes! Created with high quality vinyl that will never leave behind any sticky residue on the surface, remove and reposition wall decals as much as needed while maintaining the quality of the decals – no trickery here! 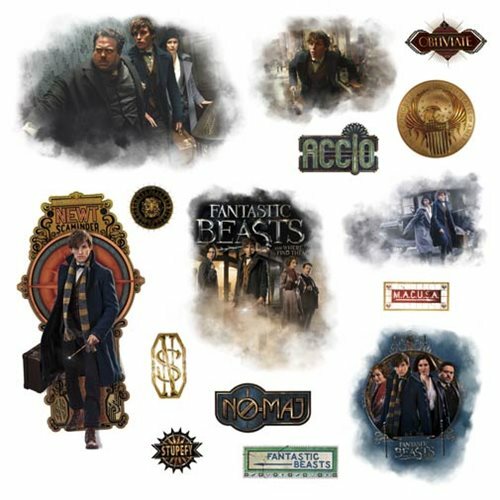 The Fantastic Beasts and Where to Find Them Peel and Stick Wall Decals comes with a total of 12 individual decals that measure from 3-inches wide x 2 4/5-inches tall to 9 1/8-inches wide x 13 1/4-inches tall. Ages 15 and up.